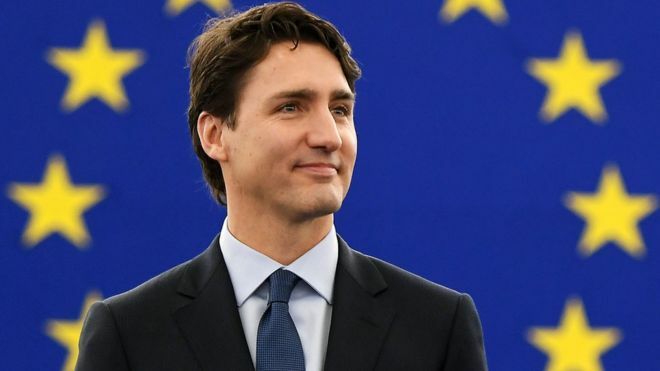 Canada’s Prime Minister Justin Trudeau says his country’s Ceta trade deal with the EU will help middle-class families and set the standard for future trade deals globally. Addressing the European Parliament, he called Ceta “a comprehensive blueprint for responsible economic co-operation”. MEPs approved Ceta on Wednesday, after nearly eight years of negotiations. Most trade tariffs will be removed. But critics say Ceta could erode hard-won welfare and environmental safeguards. But Ceta, he argued, “will result in the creation of good, well-paying jobs for middle-class workers. It is seen as a possible model for a future EU-UK trade deal, as the UK heads towards exit from the 28-nation bloc. Mr Trudeau recognised widespread “anxieties” about globalisation, but said Ceta provided adequate safeguards for governments to maintain welfare standards. The deal comes as US President Donald Trump challenges the liberal free trade agenda, vowing to put “America first”. He plans to renegotiate the North American Free Trade Agreement (Nafta) between the US, Canada and Mexico. Mr Trump has also criticised the EU’s position on free trade. In contrast, Mr Trudeau said “the European Union is a truly remarkable achievement, and an unprecedented model for peaceful co-operation. There were chaotic scenes outside the parliament building in Strasbourg on Wednesday, as protesters blocked access ahead of the vote – only to be dragged off by riot police. The vote was passed comfortably, though not overwhelmingly, with 33 MEPs abstaining. Ceta will take effect provisionally this year. But some more controversial aspects of the deal, such as the investor court system, will require ratification by EU member states, which could take years. Last year objections by Belgium’s Wallonia region threw the deal into jeopardy. Ceta will see the removal of 99% of non-farm duties between the EU’s market of 500 million people and Canada’s 35 million – trade worth €63.5bn ($67bn; £54bn) in 2015. That will boost growth and jobs on both sides of the Atlantic, supporters say. But the deal has been extremely divisive, says the BBC’s Europe reporter Gavin Lee. It has triggered many demonstrations across Europe, with critics arguing it will erode labour laws, environmental standards and allow multinational companies to dictate public policy.